We took a day trip with Charter Club Tours to Tequila yesterday. 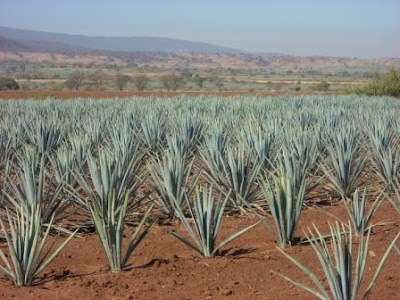 We first went to the Jose Cuervo plantation to learn all about blue agave. It was fascinating to learn about the growing of the agave plant. We got to watch as a mature plant was harvested and the "pineapple" sliced open to reveal the tender heart that is used in the making of Mexico's national drink. We then went to the Jose Cuervo distillery -- Mundo Cuervo -- in the town of Tequila. We saw the entire distilling process and we got to taste pure tequila, as well as, the "completed" product. It was an incredible tour and the professional guide that drove us from Ajijic to Tequila was fantastic. And, as my fellow Michiganders were plodding along behind snow plow trucks yesterday, we found ourselves being held up in traffic behind -- a water tanker truck -- that was watering the lawn and flowering bushes in the median of the highway. Only in Mexico! !